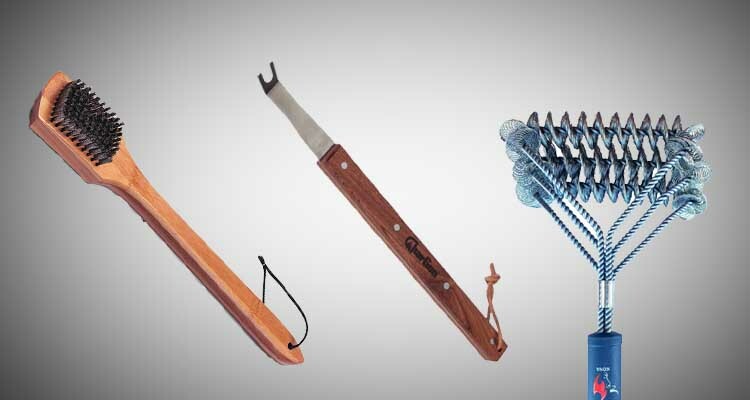 Barbecue cleaning tools may seem like a fairly dull topic. But the seemingly innocuous wire brush recently landed an Australian man in hospital — causing him serious damage and a fair bit of discomfort. A stray wire found its way into his gut and ended up poking around in his pancreas. This is not an isolated incident. Since 2012, in the US and Canada alone, there have been around 1600 reported injuries as a result of wire barbecue brushes. So, is it time to throw out all our wire brushes? Not necessarily. But ensuring that the utensils we use to clean our barbecues with are safe is clearly a topic which deserves our attention. So, let’s have a look at what other options are out there to clean your grill. If you are a fan of the wire brush, however, we’ll discuss how you can use it safely. Let’s cut to the chase. The safest bet is to avoid wire bristles altogether. And while there are nylon bristle alternatives out there, at really hot temperatures, the nylon bristles will melt. This brush is stainless steel and rust resistant. 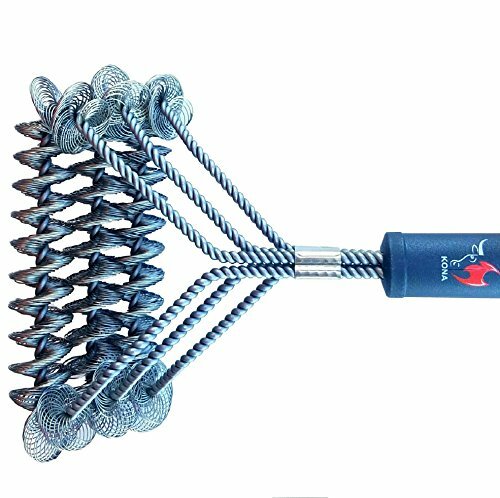 The looped wires aren’t going to fall out like the bristles in bristle brushes can, and this brush can be used on porcelain, ceramic, steel and iron surfaces, making it a great allrounder. 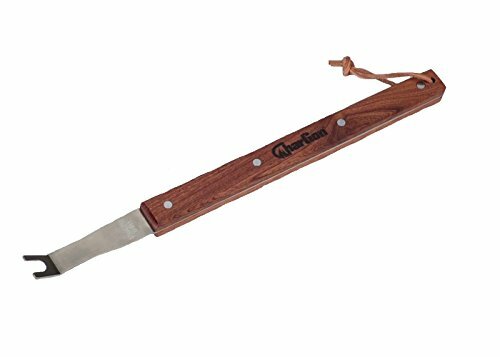 The handle of this brush is 18 inches long, meaning you hand is far away enough from the hot grill not to get burnt, and also makes it nice and easy to use. However, don’t be tempted to try and use this brush in the same way you would use a bristle brush. There is a bit of a technique to it. To get the best out of this brush, make sure that your grill plates are hot, and have a bowl of water nearby. Dip the brush into the water, and sprinkle some water onto the grates. Once the water is steaming, scrub the grates using the wet brush. You will need to dip the brush in the water a few times and work in sections. We have found that this brush is not likely to work any better than a bristle brush, but the fact that you can get the same results without needing to worry about ingesting stray bristles makes this brush a winner. The Kona Safe Clean Grill Brush is still made of stainless steel, however, the steel is in the form of looped wires that will not fall onto your food. It is a sturdy, well-made, piece of equipment. This brush also comes with a 10 year guarantee. Clearly, the manufacturer has faith in their product. You may need to use a little more elbow grease to get the job done with this brush. This brush also does not come with a scraper, which is a feature that does come in handy. Some grill brushes include average scrapers on the same head, but these never perform as well as a dedicated scraper. Keep reading to see what scraper we recommend. Despite concerns around losing bristles, some barbecuers simply prefer to use an old school bristle brush to clean their grill. They have their barbecue cleaning technique down to a fine art, and the bristle brush is an integral part of the process. At a cheaper price point and built with a custom designed scraper for Weber grills, this is an attractive option, especially for Weber fans. We have also found that generally, it is a well made tool. The handle is made of bamboo, making it durable and long lasting. For those who are environmentally conscious, it is worth noting that bamboo is also a renewable source. Another thoughtful touch is the inclusion of a loop at the end of the handle, which makes it nice and easy to hang the brush on your barbecue as you clean it. All going well, this brush should not shed bristles. If this the case, the bristles will slowly wear down over time. 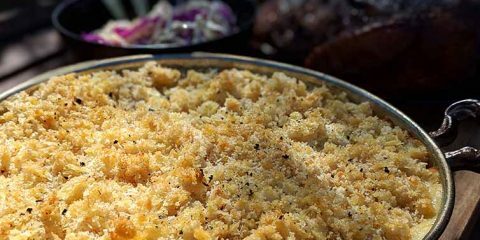 You will get better results if you use this brush while the grates of your barbecue are still hot, and the residue has not had time to become hard. The bamboo handle will not melt, is sturdier, and tends to hold on to the bristles better than plastic handled brushes which have the tendency to fall apart or warp. The metal scraper is shaped to hug the grates and gets right in between the rods. Being solid metal, the scraper feature can be used without any worry of losing bristles. No matter how you wrap it, this is still a bristle brush. As such, there is always the chance that bristles will fall out. You still need to be vigilant and check that the brush has not shed any bristles after each use. This brush comes with the option of a 12 or 18 inch handle. If you go with the 12 inch, the handle feels a little too short. When working over a hot grill, you will need to wear gloves to avoid burning your hands. 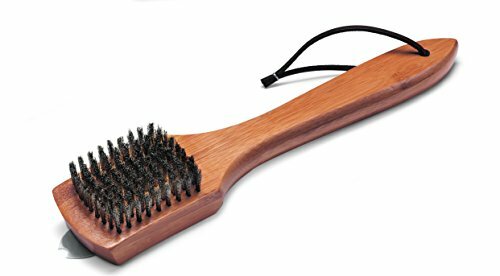 For ease of use, many prefer a brush with a slightly angled head. The head of this brush is flat. As such, it will tend to wear out toward the tip of the brush quicker, and can be a little awkward to use. Other than that this is a good safe grill brush. This product is a great option for those who would rather avoid using brush style cleaners completely. This product will get your grill very clean, and you will not be left compulsively checking for stray bristles in your burger patties. The angled ‘U’ shaped head of the Chargon effectively reaches the top, sides and bottom of your grill rods. The concept behind this product is simple. As such, as long as the product is made well, as the Chargon is, there is not much that can go wrong despite years of use. We know of people who have had this product for over a decade, and are still using their original Chargon scraping tool. A note on the care of the product — although this is a product that should last a long time, it is a good idea to keep it out of the elements. The handle is made of wood, and as such, it couldl still warp and weather if it is left sitting for long periods in the sun and rain. The Chargon will clean all round rods up to 11 mm in diameter. It is a sturdy construction of stainless steel and rosewood held together by rivets. The manufacturers claim this product will last for 500 around usages. The ‘U’ shaped scraper blade allows you to clean the sides of your grill rods simply by angling the scraper a little as you run it along the grill. It can be used effectively when your grill is hot or cold. All you need is a little elbow grease. This will only clean your grill one bar at a time, and so you may need to dedicate a little more time to the job. However, the blade is sharp and the product is sturdy, so it may not take you as long as you imagine if you really get stuck in. Even if you use this product on a regular basis, some pitmasters suggest that you should still give your grill a scrub once a year. 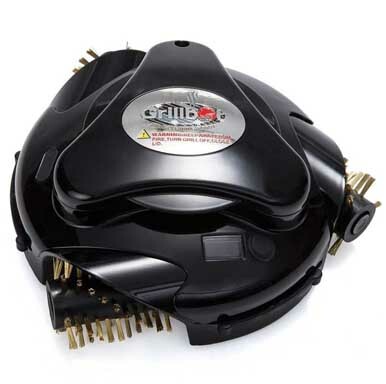 The idea is fantastic — a battery operated unit which cleans your grill at the push of a button, much like robotic vacuum cleaner cleans your floor. 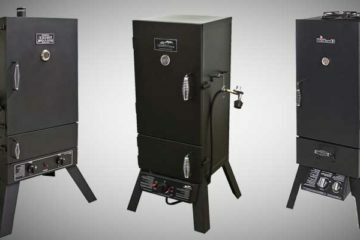 However, this little unit is dogged with issues such as brushes falling off, rotors failing, huge amounts of noise as it bangs and crashes around inside your barbecue and, most importantly, it simply does not clean the grills. Sadly, you will most likely have to whip out your manual grill cleaning tools after you have let the Grillbot loose in your barbecue. 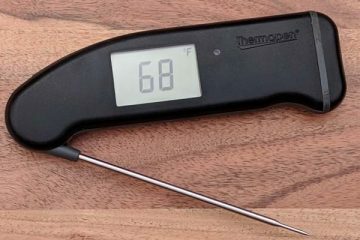 This little gadget might loosen some of the flaky residue on the surface of the grill plates, but tougher dirt, and the gunk on the sides of your grill plates, are out of the Grillbot’s reach. 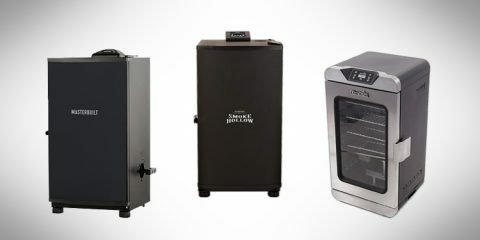 To be completely honest, a quick look at the Grillbot in action should be enough to warn you off purchasing this gadget. The concept of this product is quite simple, and could work if executed well. Stainless steel scrubbers are placed in a special ‘holder’ at the end of a handle. Once one scrubber wears out, replace it, and you are ready to go again. People who use this product are split down the middle. While some love it and swear it works wonderfully, others warn potential buyers to save their time and money and look for another option. The issues revolve around scrubbing brushes falling out of the holder, the scrubbers themselves unravelling and falling apart after one or two uses, and the plastic handle being weak and warping. The irony is, if you have purchased this item to negate the dangers of a wire brush, once these scrubbers start to fall apart you are at risk of ingesting the wire, just the same as if you had used a wire brush. Another source of angst surrounding this product is that it is very closely modelled off another product called the ‘Grill Wizard’. The Grill Wizard is more expensive, and a bit of a pain to purchase online thanks to the manufacturer’s dated website. Having said that, it is made of better quality materials, and has had positive reviews. Some who have bought the Tool Wizard believing it to be the Grill Wizard have no doubt felt a little duped. Some who have purchased this item use cheaper scourer pads bought from the local store rather than buy replacements from Tool Wizard, while others recommend stuffing two scrubbers in the holder to help them stay in place. Despite these handy hacks, for the price, this product is too flimsy and unreliable to recommend. As we have seen, there aren’t any gadgets out there that will do the job of cleaning your grill grates for you. So, let’s have a look at how best to clean your grill grates. Once you have finished cooking your meal, scrape and/or brush your grates. While it is good to do this while the grates are still hot, waiting until you have finished eating is not going to make a huge difference. Once you have cleaned off your grates, coat the surface with peanut oil. This will help prevent rust. 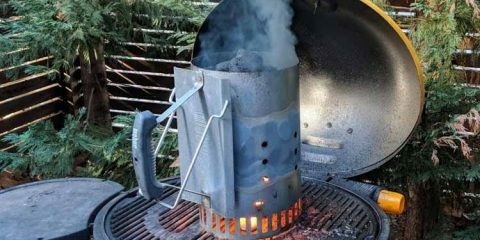 The next day, once your barbecue is completely cooled, clean all the ash out of the kettle. When you go to use your barbecue again, light the coals and let the grill get hot. This will burn of the old oil that you applied after the last cook. Give the grill another quick scrape/brush and apply a fresh coat of oil ready for the cook. If you have neglected your grill grates for some time and they have become rusty, you will need to remove the rust with either a wire brush, sandpaper, or naval jelly. Thoroughly clean off all the rust and make sure you have washed off any chemical residue left after the cleaning. Now you will have to re-season your grates. You can read up on how to do that here. For porcelain grates, you have to be a little more careful, as the coating can be taken off by harsh scrubbing, and you could void your warranty if you damage the grates in the process of cleaning. Make sure you read the manufacturer’s recommendations for cleaning the grates to be sure. Use a nylon brush to scrub the porcelain surface. If the residue is proving difficult to remove, wet the scrubber. Flip the grill and repeat this process on the underside of the grill. You may need to wait for the grill to cool a little before cleaning, otherwise you will end up with a melted nylon mess. As we mentioned at the outset, wire bristle brushes carry inherent dangers. If the wires fall out, which they often do, they can get stuck in the throat, or further down in the digestive tract. A study published in 2016 found that between 2002 -2014, it is estimated that 1698 visits to the emergency room nationwide were the result of a wire bristle injury. Sadly, sometimes these injuries can be fatal. If you decide to keep using wire bristle brushes, there are a couple things you can do to protect your health, and the health of your loved ones. For starters, if you notice even just one bristle fall out, throw the brush out immediately. Unfortunately, once one bristle falls out, they will just keep coming. Granted, it can be very frustrating if bristles start shedding within weeks, or days, of buying a new brush, but continuing to use the brush is a real hazard. Even if you have not noticed any bristles falling out, you should still take measures to thoroughly check your grill surface in case any stray bristles escaped your notice. One way to do this is to wipe down the grill grates with a damp cloth after you have cleaned them off. Some run an onion or a lemon over the surface after they have finished brushing. At the very least, inspect the grill surface carefully after you have cleaned it, and don’t clean your grill in an area with poor lighting. We hope you have found the information in this article helpful. Cleaning your grill is a tedious yet unavoidable task. Finding the safest and most effective tools to get this job done will take some of the pain out of it. Have you found any tools that work well to clean your grill? Or do you have any other questions that we have not covered in this post? Make sure you let us know in the comments section below. And if you found this article helpful, be sure to share!